PATNA: In an embarrassment to the BJP, the JD-U headed by Bihar chief minister Nitish Kumar has announced to oppose the contentious issues being raked up by its saffron partner ahead of upcoming LS polls. The JD-U which returned to the NDA in July last year is a key ally of the BJP in Bihar. “Our party stand on Uniform Civil Code, Article 370 and Ram Temple is very much clear. We can’t support the BJP over the issue,” JD-U general secretary KC Tyagi told the media on Friday. He added, “These issues are not on NDA’s agenda, they are on BJP’s agenda”. The JD-U further announced that it would not support the BJP over the issue of Triple Talaq. “The JD-U won’t support the BJP if Triple Talaq bill comes up for voting in the Rajya Sabha,” state JD- president JD-U chief Vashisshtha Narayan Singh told the media on Friday. The JD-U has six members in the Rajya Sabha. “We feel the way this bill is being rushed, it was avoidable and we feel more consultation should have taken place,” Singh added. Sharp differences occurred between the two partners shortly after the BJP distributed seats among its Bihar allies. 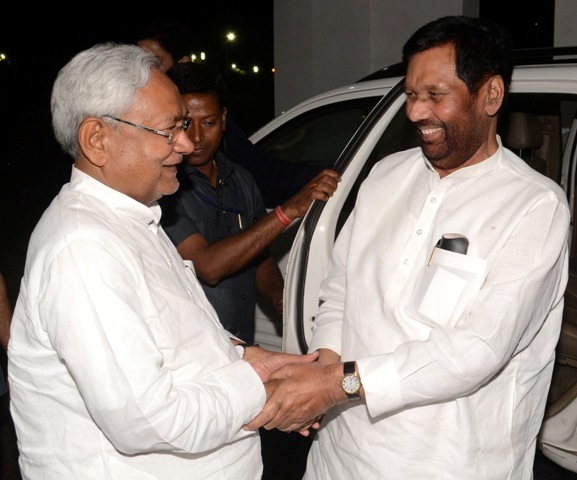 Under the deal, the BJP and the JD-U will be contesting on 17 LS seats each while the remaining six seats will go in the share of Ram Vilas Paswan’s LJP in Bihar. In another setback to the BJP, its another ally the LJP too has opposed an ordinance on the Ram temple asserting that Supreme Court’s decision on the matter should be final. “Whatever judgement the Supreme Court gives on the Ram temple issue should be accepted by everyone, be it Hindu, Muslim or any other community. Our stand has been consistent. When the PM said that we will wait for the SC judgement, then all ifs and buts should end,”the LJP president Paswan told the media on Thursday.